The Leyland Olympian model was introduced in 1979 as a successor to the Bristol VR model, with the earliest examples built at Bristol's works at Brislington. In 1983, production moved to Leyland's plants at Farington and Workington, and the model also replaced Leyland's Atlantean. The Olympian proved to be Leyland's last double deck model - following Volvo's purchase of Leyland, the Volvo Olympian remained in production until 2000. No. 1503 is significant as the last double deck bus bought new by Lincolnshire Road Car in National Bus Company era, and the last of a line of Eastern Coach Works bodied buses for the company that began in 1946 with a batch of Bristol K6A double deckers including museum resident DBE 187. 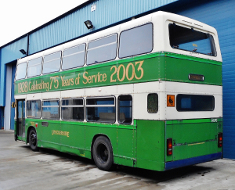 Subsequent repaints saw the bus receive variations of Road Car's green / white / yellow livery, at different stages carrying 'Humber Coachlink' livery with branding for the Cleethorpes  Grimsby  Hull service, 'Coachlink' fleet names, and finally standard 'Road Car' fleetnames. During the 1990s, this batch of Olympians was re-numbered 601 to 603, as second hand Olympians started to join the fleet. (A photo in Andy's Bus Blog of then no. 603 operating in Lincoln displaying 'Humber Coachlink' livery is here. In 2003 No. 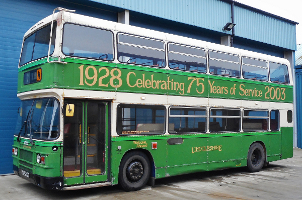 603 gained celebrity status with a repaint in to 1930s style 'Lincolnshire' two tone green and white livery to mark the Company's 75th anniversary, and gained fleet number LO 603, reflecting the vehicle make / model codes that preceded fleet numbers in Lincolnshire's pre-war fleet. It made its debut in this livery at the Easter 2003 LVVS Open Day, and carried this in to Stagecoach ownership until withdrawal in August 2008, latterly allocated to Gainsborough depot. Number 14090 (as it had become in Stagecoach ownership) passed to Johnson's of Hodthorpe, joining the fleet famous for its Bristol VRs, and continued to wear its 2003 livery on school bus duties. 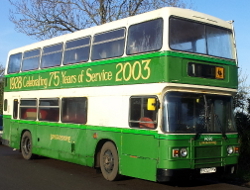 Finally retiring in 2014, the bus joined the Museum collection in December 2014, it purchase having been generously funded by two Society members. It will initially be stored away from the Museum. Initially, the 2003 livery will be smartened up, and this bus is expected to join the Society's operational fleet in 2015. July 2015 - As part of its ongoing refurbishment, the Society's latest acquisition has seen repairs made to its nearside lower and front end, while the offside lower paintwork has been sanded down prior to painting. The engine inspection door has been repanelled after the frame was shotblasted and primed. In addition, two new front tyres have been fitted. The Olympian attended the Bristol Harbourside Rally on 17 May. April 2016 - Painting has now been completed and a new MOT obtained. Many thanks to Craig who has made a magnificent job of this vehicle. All it really needs now is shot-blasting underneath - any sponsors out there?